Bellator will kick-off its eleventh season from Connecticut’s Mohegan Sun Casino on Friday, September 5 live on Spike TV. 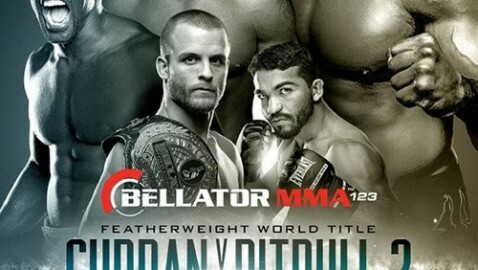 The event will be headlined by the Featherweight Title fight as reigning Bellator Champion Pat Curran defends his belt against Brazilian striker Patricio Pitbull. The night will also showcase Cheick Kongo, “King Mo” Lawal, the Bellator debut of Bobby Lashley and a full preliminary card. Kicking off the Spike.com portion of the night, will be a battle of heavy hands between Connecticut’s own Josh Diekmann and Mike Wesssel. Riding a two-fight win streak, Diekmann has recorded all 14 of his victories by finish, but will put his skills to the test against Wessel, who has recorded eight KO wins, six coming in the first round.